Have you thought about riding your bike outside for more exercise, enjoyment or transportation? The City of Kettering is teaming up with The Kettering Walk/Bike Committee to make Kettering a more easily accessible city for cyclists. The Kettering Walk/Bike Committee is comprised of local bike enthusiasts and selected City of Kettering employees with the goal of creating more biking (and walking) opportunities around Kettering. A recent goal of the committee was to encourage citizens to ride a bicycle instead of drive for short trips to support healthier habits. With that intent in mind, the committee noticed that several parks and facilities throughout the city do not have any bike parking and decided to address that issue. 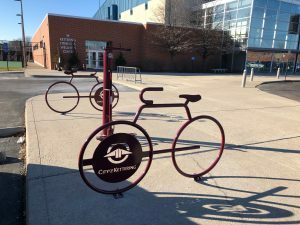 The committee made recommendations to City Council to install bike parking and fix-it stations at several parks and City facilities, and the City Council agreed this is an important investment to make Kettering a more cycling-friendly city. The City has approved $10,000 in Capital Improvement Project plans in both 2017 and 2018 to purchase bike racks to be installed at various city parks. The racks are maroon color with the City of Kettering logo laser cut into them. All installation will be done by our Parks Maintenance Division. Fix-it stations were also recommended at several of the larger parks and facilities and will be installed in the coming year. All fix-it stations are equipped with tools necessary to perform basic bike repairs from changing a flat tire to adjusting brakes. You’ll be able to hang your bike from the hanger arms, allowing the pedals and wheels to spin freely while making your repairs and get you back on the road again. You can see these new bike racks that have been installed so far at the Kettering Fitness Wellness Center, Delco Park, State Farm Park, Kennedy Park, and the Kettering Recreation Complex. 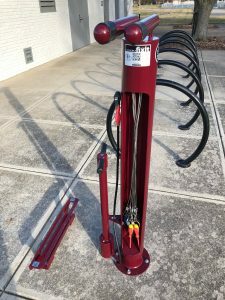 In addition to these bike racks and repair stations, the committee has also suggested purchasing portable event bike parking racks for use at large events such as Holiday at Home, Art on the Commons and any Fraze event or concert to make biking to such events much easier for the public. Whether incorporating more cycling into your life for better health, a greener planet or a bigger wallet, we hope you’ll take advantage of these upcoming investments to help you visit Kettering’s gorgeous parks and facilities, all while enjoying the view from atop two wheels instead of four. View a map of Kettering bike trails here.